Designed as a wedding gift for Anne of Brittany and her new husband Charles VIII in 1491, “Licorne Captive - Blue” was produced in France in the l5th century. 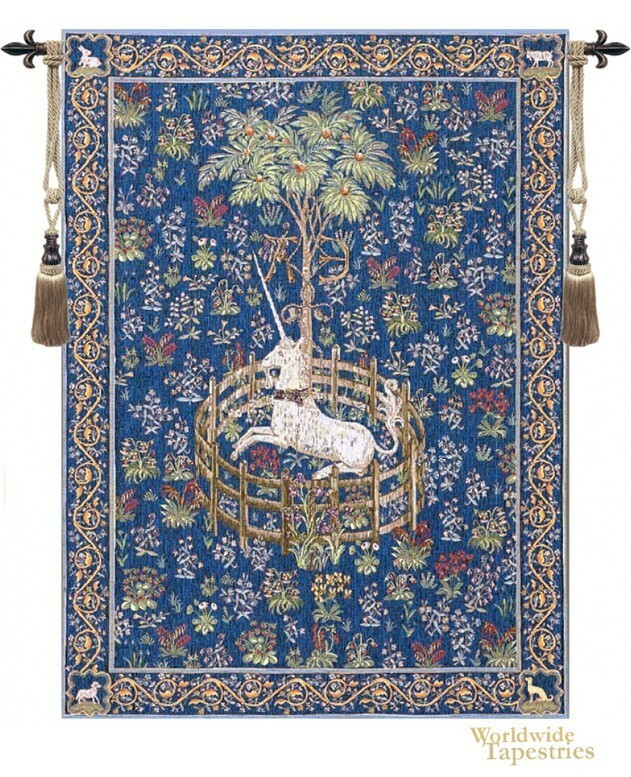 Unicorns were a popular subject of paintings and tapestries of the time. The larger work, known as “La Chasse de la Licorne”, or “Hunt of the Unicorn”, was filled with medieval symbolism. In this scene the unicorn has finally been captured. The piece just before it shows the unicorn in death. When the two are combined, it was meant to demonstrate the healing properties often associated with unicorns. To many, it also symbolized Christ rising from the dead. The original series can now be found in The Cloisters Museum in New York City. This reproduction is faithful to the original. This tapestry is lined on the back and has a tunnel for easy hanging. Note: tapestry rod and tassels, where pictured, are purchased separately. Dimensions: W 34" x H 44" W 44" x H 58"